Stir-Fried Sesame Chicken, Thyme for Cooking easy stir-fry main course. Toast sesame seeds in a dry, nonstick skillet, over medium-high heat, 3 - 6 minutes. Start flipping them or shaking the skillet after 1 - 2 minutes and remove as soon as light brown. Set aside. Heat oils in large skillet. Add onion and sauté 3 minutes. Add garlic, ginger, celery, carrot and sauté 5 minutes longer. Add soy sauce, stock, cover and simmer, 5 minutes. Add rice and sauté, stirring for 2 - 3 minutes. Add stock, cover and simmer for 15 minutes, or until done. When done fluff with fork..
Increase heat under skillet. Add peanut butter and stir until dissolved. Add cornstarch and stir until thickened. Add half of the toasted sesame seeds, stir. 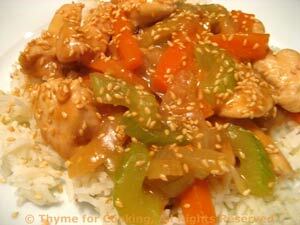 Spoon over rice, sprinkle with the remaining sesame seeds and serve.